As of this past Friday, I no longer take any medications that are notorious for causing weight gain. I just turned 45 yesterday. Granted, the older you get the more your metabolism slows down, however, it has me more concerned about my health. As of right now, other than my weight, I’m in excellent health. I want it to stay that way. I have tons of support from my friends and fellow bloggers around the world. I’m 5’5″ tall and weigh 283 pounds. My long term goal is to lose 120 lbs. Because losing that much weight is a bit overwhelming, I make shorter mini goals to get there. My current mini goal is to lose 20 pounds. I will not weigh myself more than once a week. Many of you have told me that I shouldn’t worry about the scale, but that’s not the way my brain thinks. I need specific, verifiable goals to work towards. As for being honest, I had breakfast at McDonald’s this morning and damn were those breakfast burritos tasty. What a great post. It made me smile and it made me laugh. How human are we to sit back and take stock of our lives, be honest about the main problems in our lives and with pure honesty admit to doing the one thing we know we shouldn’t be. At a time of need and comfort McDonalds has been my best friend/enemy too!Keep up all the great work you have done and I know you will continue to strive to do. you look like my dad!! good luck with the losing weight im putting on weight quick with zyprexa things i have never thought of in a food sense before seem tasty! @Susan Yep, just like eating an elephant…one bite at a time. @john sullivan Depakote is the final weight gaining drug that I was taking until last week. I'm hoping it will make it easier now to loose. @Robin Thank you@john d All great advice. Thank you@girl blue Cutie Pie? Well, shucks that's nice@LM & K I've heard many stories of people doing much better after getting off certain meds. I hope I can add to the statistic. i think we constantly need to re-think our goals. well, i do, at least.it’s interesting what you think of as a mini goal (we are all SOOO different, aren’t we?) – 20 pounds would be a major goal for me.one thing that has always worked for me is to ask myself, what task can i set myself that is so small, so tiny, that i have absolutely no reason whatsoever not to do it?bradley, would you like to submit one of your articles on weight loss to the carnival of eating disorders? Hi Bradley,We really haven’t been formally introduced, but keep bumping into eachother in the blogopshere. I do read your blog every day though.I understand about the weight- I am five feet tall, and thanks to psych meds I have put on almost 100 lbs over the years. I just lost 56 lbs, with another 30 to go. It’s hard. The first ten or so came off easy, but the more I loose the harder it gets. All I can say is hang in there, and I am in your corner rooting for you.Would like to talk to you offline, I am very active in my state and local DBSA too. Keep on, Keep on…. Okay, you need to lose some weight, that’s a given, for the sake of your health. But you look pretty damn good! hi bradley, my sister-in law has bipolar as well and she lost a lot of weight after she stopped taking her medications.i hope you achieve your goal about loosing weight..i wish you luck. 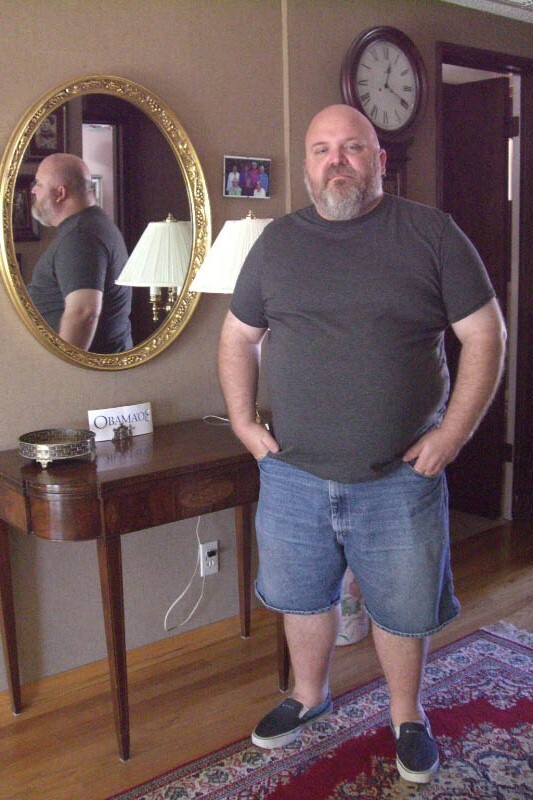 Hey Brad Just wanted to stop by and say helloThis may be way off base but back a few yrs ago I was on depokote and I went up to 275 I know many of the meds dont help in terms of weight loss.I try to love me no matter what I weigh and now I weigh about 210 which is FAT but I like it and I do and eat what I want.PS I guess what I’m saying is somethings may be out of your control.I always appreciate your honesty in your journey. Do-overs are ok. At least far better than not going for the do-over. You’re human, Bradley, whether you like it or not 😉 We fall down on the job at times. As long as we keep getting back up, it’s ok. Good luck on both the mini and major goals! At least you enjoyed the food – the worst calories to eat are the ones that you do not enjoy!